A certain generation of South Carolinians can remember hot summer nights spent at the Pawleys Island Pavilion. Four wooden buildings actually housed the once-popular beach spot over the course of the twentieth century. The first was built during the early 1900s just north of the South Causeway. As the story goes, even during Prohibition, beachgoers could dance and imbibe at the pavilion – provided you had the right connections. That building was eventually converted into a private beach house, and another pavilion was built near the same spot in 1925 by Cliff Davis. It was called Davis’ Little Pavilion. Ten years later, in 1935, Davis’ Little Pavilion was replaced with a third pavilion, also near the South Causeway. By the time the third pavilion – known formally as Lafayette Pavilion – was erected amongst the dunes of Pawleys Island, live music had become a mainstay at the parties held here. Just as famous musicians such as Charlie Parker and Duke Ellington were playing down the road at the Magnolia Beach Club, local bands had people dancing at Lafayette’s until it burned in 1957. The last pavilion to grace Pawleys Island – and the one many are still nostalgic for today – was built in 1960 out into the marsh near the North Causeway. The two images above reflect the building during that era. People remember popular musicians playing the pavilion all night long. Many bands promoted on the radio along the Southeast coast would make a stop at the Pawleys Island Pavilion, where dozens of cars lined the island as young people poured into the dance hall. Musicians such as Maurice Williams and the Zodiacs played here, and dancers would shag to hits by the Drifters, the Embers, and the Rivieras. Sadly, the pavilion was burned on June 16, 1970 by an arsonist – this time not to be replaced. Many suspect that the culprit was a property owner who had had enough of the joviality that permeated an otherwise quiet island. Aside from two inns that sit on the south side of the island, there have been no commercial buildings on Pawleys Island since. Each May the Town of Pawleys Island hosts a Pavilion Reunion at the Pawleys Island Nature Park at the North Causeway, near the location of the last pavilion. The event includes food, fun, and – of course – dancing! Do you have a story or an old photo of the Pawleys Island Pavilion that you would like to share with us? If so, please send it to the South Carolina Picture Project. Thank you! Hi Myrna! Every source we can find says 1957, but if you find one that confirms it was later, please let us know, as we want to make sure we have all of our information correct. Thank you! Could you possibly have the year for the Lafayette Pavilion burning wrong? I met my husband at PI in 1958 and I know I went to the pavilion. What do you know about the green/white Chevrolet car in front of the original pavilion picture? Some say it looks like a car my father owned from Andrews. Thank you so much for sharing this with us! What great memories! I remember going to both the Lafayette Pavilion and the one that was built later near the north causeway. The Lafayette had a green painted door and the first time I went there during Easter Weekend of 1956, the song “What’s Behind the Green Door was playing on the jukebox. 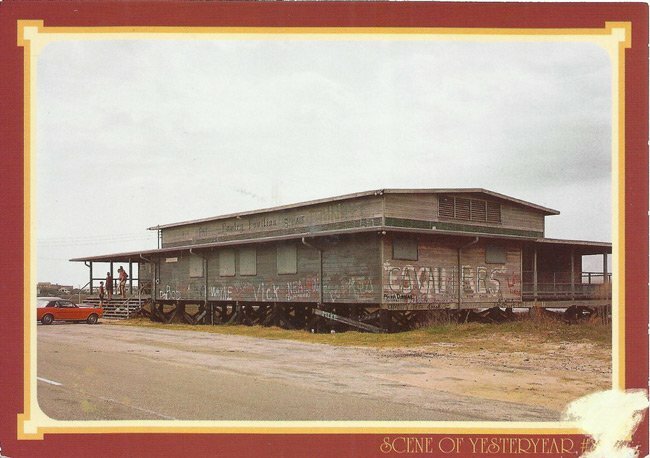 I spent many a summer night there and even a few day hours hanging out usually with my Winyah High School friends. Some of you old timers may remember a guy named “Big Moose.” Everyone got out of his way. The story was that he had been “shell shocked” in the Korean War. This was a wonderful time in my life and I got to meet lots of people from all over our state. I painted the Pawleys Island Pavilion in 1999 and had limited edition, signed and numbered prints made at that time. It is very similar to the painted done by Gene Brigman in 2007. My friend, Mary Thomas Dobbins, gave me a picture. Her father, Albert S. Thomas, was the architect that drew the plans. Friends of mine from Sumter, SC were sitting on the steps in the picture she gave me. I would love to add my print to your collection. In 1955 while in high school in Georgetown, SC, I started going to what I call the Old Pawleys Island Pavilion near the aouth causeway. I spent a many a night there from the time it opened in the spring until it closed in the fall. Spring was when there were house parties at Pawleys. House parties meant lots of young ladies to dance with. The juke box was filled with beach/shag music and would play three songs for a quarter. The Old Pavilion from 1954-1957 did not have a covered porch as shown in the drawing. The Pawleys Pavilion was designed by my father, Albert S. Thomas, Jr. from Columbia, S.C. He was an architect partner of Southern States Construction Company.